First, with the current BTest-2 machines + an SD slot or the BTest-3 hardware upgrade, it is technically possible to run Windows XP on the OLPC. We have been engaged in dialog with Nicholas Negroponte and his team regarding the plans for OLPC for some time. 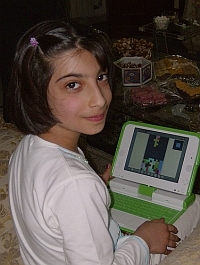 As part of our ongoing discussions, OLPC has provided us with a number of beta XOs. With those in hand, we currently are in the process of evaluating the feasibility of running Windows on the XO device. While we are pleased with the progress to date, we still have significant work ahead to finalize our analysis and testing processes. Microsoft has some XO machines. They are trying to get Windows working on it. Sometimes they show up and ask random hardware questions. The OLPC guys say "look at the code." They go away again. Sometimes they brick machines (because they have to replace the awesome firmware we have with a poopy PC BIOS) and send them back to the office to get them unbricked. Sometimes they complain that the machine has hardware problems and we reply that it works fine here. The One Laptop Per Child project is committed to free, open-source software, according to CTO Mary Lou Jepsen. But it also believes in operating system choice. Microsoft has "had our hardware now for about a year," says Jepsen. 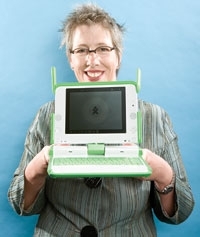 "We decided that, as much as we embrace open-source at OLPC, it is about choice, and we don't want to exclude anybody from making software for our laptops. I personally am not in the business of forcing people to use my products but rather developing the product for specific needs and letting the customer choose. I’m in the business of building better systems, period. And now let us be sure that the Sugar user interface running on Red Hat Linux is really the best learning experience. Let there be head to head testing of both operating systems on the OLPC XO. Even if we all believe that OLPC vs. Microsoft is a clash of civilizations and Microsoft code is wrong for XO's or education. "Microsoft has some XO machines. They are trying to get Windows working on it. Sometimes they show up and ask random hardware questions. The OLPC guys say "look at the code." They go away again. Sometimes they brick machines (because they have to replace the awesome firmware we have with a poopy PC BIOS) and send them back to the office to get them unbricked. Sometimes they complain that the machine has hardware problems and we reply that it works fine here." Sounds like the XP code-base is completely unlike FLOSS. And we still don't have XP on OLPC in the wild. Maybe Windows cannot run on OLPC! But who will admit that? Certainly not Microsoft or Negroponte. the official MS position still states that WINXP min sys requirements are at least 1.5gb just for the OS. It might be possible to clean xp code, to add extra memory via SD for the OLPC or to install a upgraded version of win 2000 or 98 specially fitted for the green machines, maybe even with a luna user interface. But I seriously doubt that MS is putting aside enough developers resources to those, vista is just fresh out there, and there is not much money to be made on it. Microsoft is probably waiting to see how negroponte goes, and then later they will take care of it. By the time Sugar takes at least a 0.5% market share maybe it will have been already upgraded again.. But thanks for clarifying all those issues. I am sure that there is already a lot of FUD from us the geeks concerning this system war..
you can install windowsXP with well below 1,5 gb. 800mb are sufficient. winxp will complain, but install nevertheless. the problem is that you will be missing out on additional drivers and will have to put in the cd/ various driver cd's every time any hardware changes. so it is quite possible to streamline xp to a specified platform with no difference in hardware. "I don't know how to get the thing to run on less than 2 gigs," he said. Plus, at least 10 custom drivers — which tell an operating system how to interact with hardware — need to be designed, Poole said. 350MByte is no problem. And maybe even less, if everything is taken out, that is normally necessary to cater for hardware changes. But do we really want MS-Windows on the OLPC? I don't think so. However, adding a SD-Card slot is a good idea, as it allows a backup of the user data, if a machine has to be repaired or exchanged. The hard part is to find a non-bloated AntiVirus these days..